Move-in ready! Wonderful ranch style home on quiet cul-de-sac location! Have a cup of coffee or glass of wine, as you wind down on the private deck with pergola. Plantation shutters throughout the home. 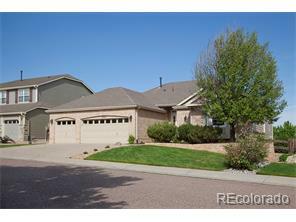 Hardwood floors, slab granite countertops; large center island; planning desk; great room with 2-sided gas fireplace! Fully remodeled 5-piece master bath with incredible finishes that include; slab granite; his and her sinks; soaking tub; private shower and walk-in closet! Enjoy the walk-out lower level that is perfect for family gatherings and entertaining friends! It is rare to find a WALK-OUT RANCH with a layout that works both for a family and for empty -nesters. This home will not disappoint. UPDATES INCLUDE: MASTER BATH, SECONDARY BATH, KITCHEN, BASEMENT BATH, WINDOWS, PAINT and CARPET. Seller is being transferred, so please call for additional details.